The last time I happen to stumble onto a major ruin during an important day was a few years ago. I was atop of Machu Picchu for the Winter Solstice (June 2003). Machu Picchu was build for two special days of the year – the Winter Solstice and the Summer Solstice. On those days, you can watch the sun peak over the Andes and set Machu Picchu on fire with light reflecting off water falls and damp rocks. It really is an extraordinary site! That trip my life changed. After the Incan light show, I took time to meditate about my life and I was drawn to creating a life of purpose – the only problem was, I did not have a plan. Funny how fate works…. We were coming home on an American Airline’s 757 when we lost an engine over the Andes. The captain said, “Well folks, it looks like we lost an engine” as the smoke billowed from the air vents and the alarms blared. It was that Winter Solstice when I decided that life was way too short and I need do stop fooling around and I started Tango Diva. I wanted to inspire and empower women and travel was how I was going to do it! 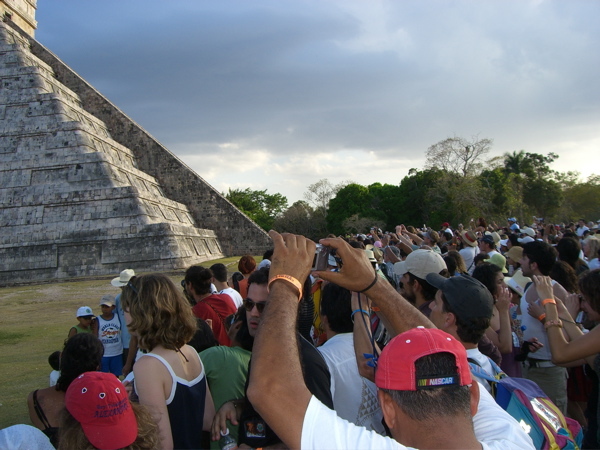 This year, I had the pleasure of being at Chichen Itza for the Spring Equinox. Just like Machu Picchu, Chichen Itza was build for two special days of the year – the Spring and Autumn Equinoxes. On those days, the Feathered Serpent visits and illuminates the main pyramid on the site. We got there early and walked the grounds with our amazing tour guide and lecturer named Paco. He took us through the maze of Mayan ruins, explain the significance of each. For lunch we drove to a cenote, where we swam in a mystical underwater cave and splashed around like kids in a fairytale – it was truly spectacular. We headed back to Chechen Itza to watch the mysterious “lighting of the Feathered Serpent.” At first, we worried because there was one huge cloud cloaking the sun and casting dim shadows on the ruins. For this “lighting” to work, the sun needs to be bright. So, all 10,000 of us just waited and prayed. Paco assured me that with all the pilgrims coming from the four corners of the earth, Mother Nature would not disappoint and she would put on a magnificent show. I must admit, I was a bit skeptical for a while…. Then all of a sudden, the cloud broke and the Feathered Serpent lit up like a Christmas tree and the crowds went crazy with gratitude and amazement. The Spring Equinox is all about hope and renewal. So, I spent some time meditating about what that meant to me. And what filled my mind was, “Life is not an emergency, take the weekends to enjoy the beauty around me, slow down, and relax.” As a Type-A person, that was hard at first – hey, it is still hard! But slowly I am dragging myself away from the computer on sunny Saturday and Sunday mornings and I try to walk away from my computer by 9 pm (that is good! I usually work until past 11 pm!). So, how do I feel about these new changes in my life? I feel a bit more peaceful and less overwhelmed. Yeah, life keeps going at its frenetic pace and deadlines loom like bad smells. But now I make sure to take a little time everyday thank the Feathered Serpent for the subtle reminder that life is a fantastic show that should be savored moment by moment and not a hungry deadline waiting to be fed. What lessons have your learned during this time of renewal, Easter, Lent, Passover and the Equinox? We will be in Meixco this year during the sprng solstice. Would like to take our family to see the awesome spectacle, but a little worried about crowds, being able to see it, etc. Any suggestions? Did you use a speciifc tour company? Would appreciate any info you can provide. Yes, I would recommend taking a tour to the site. It is amazing and because everyone there is very spiritual, the crowd is very calm and kind. Many people wear white, it is amazing! So, the deal is to be there around an hour before the equinox. That is around 4 pm. What happens is that tour buses pile in during the morning and everyone walks the ruins before the mid-afternoon sun. Then they head to the cenote – which is unbelievable. The tour I was on included lunch at the cenote. Then, you return to the site and everyone gets ready. Everyone is so calm and relaxed that it is really easy to move up to the front. I will look into the company we used and get back to you. Also, you might want to think about staying in Merida, instead of Cancun. It is closer and a beautiful historic Mexican city. More to come!